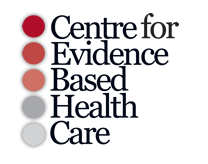 The Centre for Evidence-based Health Care (CEBHC) is a coordinating and directive institution for research and training of the Faculty of Medicine and Health Sciences, Stellenbosch University, in the field of evidence-based health care. The work of the CEBHC is guided by the constitution of the Centre. The Centre is managed by the Director and her management committee, while oversight is provided by the Governing Board.